"The "eggs in hell" #pizza at @pizzamoto features bacon and mozzarella arranged around the cyclopean eye of a single sous-vide egg. 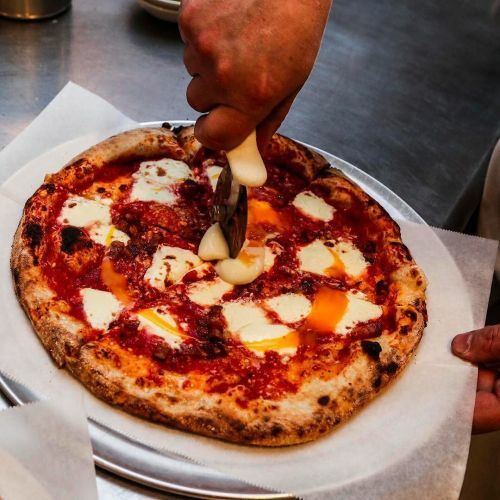 The crust here is in the modern Brooklyn-Neapolitan family: sturdy, but not brittle or tough. It crackles upon meeting your teeth, but its white interior is delicate, filled with small air pockets. The @nytfood critic Pete Wells describes the creative pies found at @pizzamoto — clam pie, anyone? — as "among New York's brick-oven best." Visit the link in our profile to read more about this pizzeria found in the underpopulated borderland between the Carroll Gardens and Red Hook neighborhoods in Brooklyn. @kristaschlueter photographed the "eggs in hell" pizza for @nytfood. #🍕" By nytimes on Instagram.